In June 2011, Accurate Realtime Inc. won the bid to CART caption for the national convention of the Canadian Hard of Hearing Association in Yellowknife, Northwest Territories. As Catherine Siegler, the captioning company’s president, was writing the awards luncheon, to her surprise and consternation, she was asked to leave her post and mount the stage. 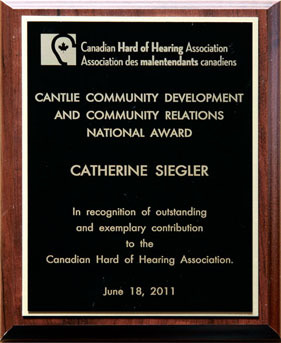 She was then presented with the Cantlie Community Development and Community Relations National Award, "in recognition of outstanding and exemplary contribution to the Canadian Hard of Hearing Association." Catherine is very proud of this plaque, the deaf and hard-of-hearing’s appreciation of her 20 years of service to that community. She says that instantly converting speech to text so those with hearing difficulties can understand and follow what’s going on, is part of what an inclusive society is about. "We know the work we do is essential as evidenced by the increasing demand for verbatim captioning, but to be recognized by the community we serve is most gratifying!"